Melvin Horace Purvis II (October 24, 1903 – February 29, 1960) was an American law enforcement official and Federal Bureau of Investigation (FBI) agent. Given the nickname "Little Mel" because of his small boned 5′4″ (163 cm) frame, Purvis became noted for leading the manhunts that tracked such bank robbers as Baby Face Nelson, John Dillinger, and Pretty Boy Floyd, but his high public profile was resented by local law enforcement. Purvis asserted he had killed Floyd single-handed, others variously claimed that Floyd had been already wounded, or even that Purvis had ordered Floyd summarily shot dead for refusing to provide information. Purvis had the reputation of using very tough methods against recalcitrant interviewees. Roger Touhy, a minor-league gangster who was arrested as Purvis fought the huge Capone organisation during Prohibition, alleged he suffered the loss of 25 lbs of body weight and several teeth plus broken vertebrae due to being beaten every time he fell asleep during weeks of questioning by Purvis's men. Purvis became the FBI's star, having captured more of the designated public enemies than any other agent, but found himself sidelined after he began to enjoy better press than J. Edgar Hoover. Purvis was born in Timmonsville, South Carolina, to Melvin Horace Purvis, Sr. (1869–1938), a tobacco farmer and businessman, and Janie Elizabeth (née Mims, 1874–1927); he was the fifth of eight siblings. Purvis was a well-educated man, and known to be a crack shot. He received his law degree from the University of South Carolina School of Law and had a brief career as a lawyer. Purvis was a member of the Kappa Alpha Order while attending South Carolina. He joined the FBI in 1927 and headed the Division of Investigation offices in Birmingham, Oklahoma City, and Cincinnati. In 1932, he was placed in charge of the Chicago office by Bureau of Investigation Director J. Edgar Hoover. Purvis led the manhunts that tracked outlaws Baby Face Nelson and Pretty Boy Floyd, and most famously John Dillinger, which ended in Chicago on July 22, 1934. However, after Purvis became a media figure for this feat, Hoover claimed that Purvis had been demoted and agent Samuel P. Cowley had been put in charge of the Dillinger case. Cowley was later shot by Baby Face Nelson, and Purvis visited him in the hospital shortly before he died. Purvis was praised for his actions. He reportedly incurred the wrath of Hoover, who had previously supported him but now supposedly felt overshadowed. In a 2005 book co-authored by Purvis's son Alston, Hoover is portrayed as jealous of the attention given to Purvis after Dillinger was killed. At least one of Purvis's official accounts of his exploits was later called into question. Purvis's story of the death of Pretty Boy Floyd indicated that Purvis and his agents had killed him with no assistance from local law enforcement. This was later disputed by Chester Smith, an officer with the East Liverpool, Ohio police (Hoover would later state Smith had shot Floyd first). Officer Smith said that Purvis and his agents never fired until after Purvis had attempted to question Floyd. After Floyd responded with curses, Purvis ordered Agent Herman "Ed" Hollis to shoot Floyd, who was lying wounded on the ground. This claim was discounted later by retired FBI Agent Winfred E. Hopton, who wrote in a 1976 letter to TIME that local law enforcement, including Captain Smith, weren't even present until after Floyd had died. Of course, this version conflicts with the one from local authorities which has Smith initially wounding Floyd. Neither claim has been clearly proven. Purvis resigned from the FBI in 1935 and afterward practiced law. In 1937, he became engaged to actress Janice Jarratt, but they never married. He later married Marie Rosanne Willcox, and they had three sons. In 1936, Purvis published a memoir of his years as an investigator with the Bureau, entitled American Agent. Purvis served in the United States Army as an intelligence officer during World War II, reaching the rank of colonel. He assisted with compiling evidence against Nazi leaders in the Nuremberg trials. 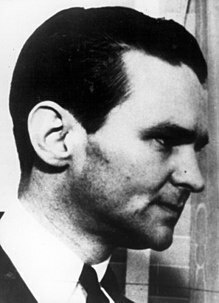 On February 29, 1960, Purvis was at his home in Florence, South Carolina, when he died from a gunshot wound to the head; the shot was fired from the pistol that was given to him by fellow agents when he resigned from the FBI. The FBI investigated his death and declared it a suicide, although the official coroner's report did not label the cause of death as such. A later investigation suggested that Purvis may have shot himself accidentally while trying to extract a tracer bullet jammed in the pistol. He was 56 years old. Purvis was portrayed by Dale Robertson in G-MAN: The Rise and Fall of Melvin Purvis (1974), from SCETV's Carolina Stories documentary series (1974). Purvis was portrayed by Scott Brooks in the History Channel documentary on infamous gangsters, Crime Wave: 18 Months of Mayhem (2008). Melvin Purvis - G-Man is a 1974 American TV movie about Melvin Purvis, starring Dale Robertson. Purvis was portrayed by Ben Johnson in the film Dillinger (1973). He was played by Geoffrey Binney, opposite Martin Sheen, in the title role of the TV movie The Story of Pretty Boy Floyd (1974). Purvis was portrayed again by Dale Robertson in the TV movie The Kansas City Massacre (1975), a sequel to Melvin Purvis - G-Man. He was portrayed by Michael Sacks in the film "The Private Files of J. Edgar Hoover" (1977). He was portrayed by Alan Vint in the film The Lady in Red (1979). He was portrayed by Will Patton in the TV movie Dillinger (1991). Purvis was originally portrayed by Chuck Wagner in the musical Dillinger, Public Enemy Number One (2002). Purvis is portrayed by Christian Bale in the film Public Enemies (2009). In 1937, Parker Brothers published a game called "Melvin Purvis' 'G'-Men Detective Game." Purvis appears with Eliot Ness as an agent of the "Federal Bureau of Ideology", in pursuit of labor activist Tom Joad, in Kim Newman's alternate history novel Back in the USSA (1997). Purvis is the title character in Denis Johnson's play, Purvis. Purvis appeared as a contestant on the game show To Tell The Truth (aired September 24, 1957). ^ "Melvin H. Purvis, FBI file #67-7489". Federal Bureau of Investigation. Retrieved July 23, 2013. ^ "The John Dillinger Story: Little Bohemia Archived 2006-12-22 at the Wayback Machine, Crime Library; accessed January 15, 2018. ^ South Carolina Death Records, 1821-1955; "Melvin H Purvis Sr."; died on 16 January 1938. ^ Purvis, Alston; Tresinowski, Alex (2005). The Vendetta: FBI Hero Melvin Purvis's War Against Crime and J. Edgar Hoover's War Against Him. Public Affairs. ISBN 1-58648-301-3. Archived from the original on 2008-12-14. ^ "American Agent — Melvin H. Purvis — Doubleday, Doran ($2.75)". Time. November 23, 1936. Retrieved 2008-04-21. Slight (127 lb. ), wiry, red-haired and superstitious, he studied law at the University of South Carolina, practiced for two years, went to Washington in 1927 seeking a post in the State Department, got one in the Bureau of Investigation. ^ Melvin Purvis acting as spokesman for Dodge automobiles, Good Housekeeping magazine, April 1936. ^ Purvis, Alston; Tresinowski, Alex (2005). The Vendetta: FBI Hero Melvin Purvis's War Against Crime and J. Edgar Hoover's War Against Him. Public Affairs. ISBN 1-58648-301-3. ^ "Gangsters' Foe Resigns. Melvin Purvis Leaves His Department of Justice Post in Chicago". Los Angeles Times. July 13, 1935. Retrieved 2008-04-20. Melvin Purvis, nemesis of some of the country's most notorious public enemies, including the late John Dillinger, has resigned his position as head of the Chicago office of the Department of Justice. ^ "Milestones". Time. May 10, 1937. Retrieved 2008-04-21. Engagement Broken. Between Melvin Horace Purvis Jr., 34, famed onetime G-Man who now practices law in San Francisco; and beauteous Janice ("Toots") Jarratt, cinemactress, onetime Lucky Strike model, "Sweetheart of the Texas Centennial"; in San Antonio, Tex., three days before the wedding date. ^ "Melvin Purvis to Wed Janice Jarratt, Actress". Washington Post. March 18, 1937. Retrieved 2008-04-20. ^ "Purvis and Actress Part. Wedding to Miss Jarratt Is Off, Former G-Man Heads for Coast". New York Times. April 28, 1937. Retrieved 2008-04-20. Janice Jarratt and Melvin Purvis went their separate ways tonight, both noncommittal on the sudden postponement of their marriage only two days before their wedding date. ^ a b "People & Events: Melvin Purvis, 1903-1960". American Experience. Retrieved 2008-04-20. ^ Purvis, Melvin (1936). American Agent. Garden City, N.Y.: Doubleday, Doran & Co. OCLC 612771326. ^ McCombs, Don; Worth, Fred L. (1994). World War II: 4,139 Strange and Fascinating Facts. Wings Books. p. 481. ISBN 9780517422861. ^ What They Didn't Teach You About World War II. Simon & Schuster. 2002. p. 78. ISBN 9780743445139. ^ Harwood, Richard E. (1978). "Nuremberg and other war crimes trials: a new look". Historical Review Press. p. 13. ^ G-MAN: The Rise and Fall of Melvin Purvis. SCETV. April 4, 1074. Archived from the original on November 28, 2010. ^ "Melvin Purvis G-MAN". IMDb. April 4, 1974. ^ Colin Price (March 2, 2016). "Melvin Purvis: The Gang Buster". American Lawmen (2016– ). Season 1. American Heroes Channel. ^ To Tell The Truth, Youtube, September 24, 1957. Potter, Claire (1998). War on Crime: Bandits, G-Men, and the Politics of Mass Culture. Rutgers University Press. ISBN 0-8135-2487-3. Purvis, Alston; Tresinowski, Alex (2005). The Vendetta: FBI Hero Melvin Purvis's War Against Crime and J. Edgar Hoover's War Against Him. Public Affairs. ISBN 1-58648-301-3. Archived from the original on 2008-12-14. J. Edgar Hoover: The Man and the Secrets, by Curt Gentry (1991). Official and Confidential: The Secret Life of J. Edgar Hoover, by Anthony Summers, Putnam (1993).